While I was running the Philadelphia Marathon, my husband took this picture of our two sons (on the right) alongside their two cousins (on the left). They were waiting to see me at the 20-mile mark in Manayunk. Well, nostalgic, of course. But on a deeper level, it makes me think about memories from a kid's point of view because the image captures how ordinary - okay, boring - the event was for them. You'd never know these kids were at an event with cheering spectators lined up along this part of the marathon route if it weren't for the runner reflected in the store front window. To me, that is the essence of childhood. The stuff that matters to an adult just isn't a big deal for a kid. No. This surprised me completely. Of course, I wasn't there at that particular moment when the photo was taken. But even so, I doubt my husband even noticed the reflection in the window. I'm not sure. 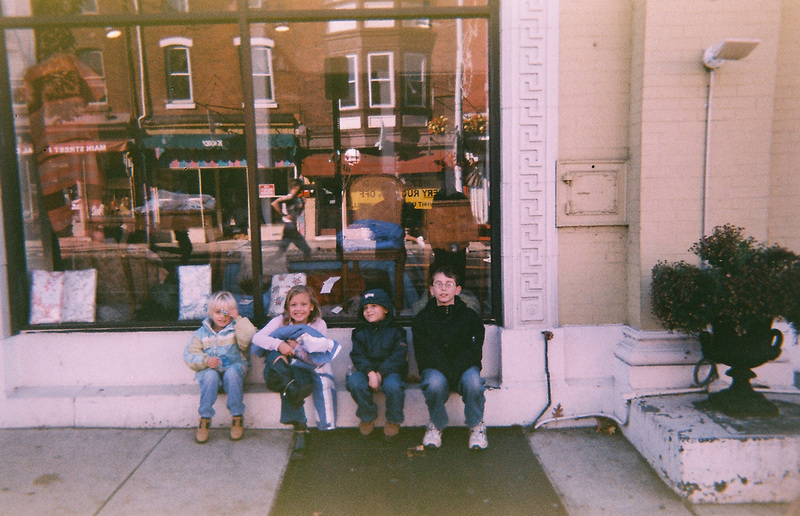 When I try to look at the photo as if I don't know the kids in it, I still definitely see their personalities - from the extraverted older two, to our more introverted younger son, to our easy-going younger niece who could make a game out of a candy wrapper. More so, I just feel their boredom, that kid-like impatience. It's as if each by their facial expression and/or body language are saying, "This is a total drag. Can we go now?"